It isn’t what you bring that makes a difference. What makes the difference is that you bring it to Jesus. He can take the little you have and make it enough – more than enough. NOTE: THIS IS ANOTHER MESSAGE THAT WILL PROBABLY BE MORE MEANINGFUL IF YOU LISTEN TO THE AUDIO VERSION. IN THE AUDIO, I INVITE YOU TO LISTEN AND GET INTO IT WITH YOUR IMAGINATION. I love this particular passage of scripture. In one elegant action, Jesus accomplishes so much. First, he shows his miraculous power once more. Second, he takes care of a bunch of hungry people. Third, he uses it as an extremely effective object lesson for his disciples. To which, I say, politely, “That is a load of male-bovine defecation” (figure it out). I say this for several reasons. First, the reason most people gravitate toward the idea that the miracle was “sharing” is because they believe in sharing, but they don’t really believe Jesus was capable of providing more food than was there to start with. In other words, it starts from a point of disbelief. Second, the idea is in itself nonsensical. Everyone ate, and there was a significant amount left over. If there was no miraculous provision by Jesus, then obviously, everyone had more than enough to start with. In other words, in this scenario, sharing wasn’t even required. If that’s the case, the “miracle” is reduced to the fact that Jesus got a bunch of people to sit down and eat their supper. I could see the miraculous aspect of this if they were all three-year olds, but for adults, that is ridiculous. Third, this was widely reported as a miracle, and it made a huge impression on the people. People don’t generally get excited and worked up just because they heard that some other people ate supper. They don’t usually see it as a messianic sign that one man can get five-thousand people to unpack their bagged lunches and eat them at dinner time. But clearly, the disciples, and the others who were there, took this event as a sign that Jesus was someone special. John records their reaction to the feeding of the five thousand. This response makes no sense if all Jesus did was to get them to eat the food they had already brought. All right, now that we have settled that if anything happened here at all, it was miraculous, let’s get on with it. As we have sometimes done in the past, I want to invite you to put yourself into the middle of the situation with Jesus. It’s been a difficult time. You just heard that John the Baptist died. You and some of the other disciples knew John pretty well – in fact, it was John who first told you about Jesus. But Jesus knew him even better than you did. The news of his execution has hit you all hard. Jesus wants to get away from it all for a while, and you agree whole-heartedly. You all climb into Simon-Peter’s boat and head across the lake. The trip is peaceful and healing, but not long after you put ashore, far from any town, people start showing up. Someone must have overheard where Jesus was going, and now they are all here, begging for him to heal their diseases and illnesses. Jesus is tired and full of grief, but when he looks at the people, you can see his heart going out to them. He closes his eyes for a minute in silent prayer, and then starts going through crowd, healing those who need it, and then speaking about the kingdom of heaven. More and more people keep coming, until there are enough to populate a small town, and even more. It’s been a long afternoon, and now evening is coming along. You start getting hungry, and then it hits you – what about all these people? You cut across the lake in the boat with Jesus, but these folks spent a good portion of the day walking, and if they make it home at all tonight, it will be very late. Now seriously, this isn’t fair. You didn’t want these people here in the first place. Jesus was the one who encouraged them to stay when they started showing up. He’s the one who got you into the situation, and now he tells you to figure it out? You look around the crowd. You would have to work for about nine months and save every single penny of it in order to buy enough bread for everyone to have a small bite. In truth, the cost represents more money than you expect to save in a lifetime. You ask around, after a while, what you come up with is five small loaves of barely bread and two dried fish, each one less than ½ a pound. You take it to Jesus. Now, honestly, you do that more just to show him how impossible the situation is, than for any other reason. He looks at you with a big, slow smile. He starts by thanking the Father for the pathetic little meal. Then he breaks off some of the bread, and about half of one of the fish, and hands the food to Peter. “Go on and break off pieces, and give it to the people,” says Jesus. He breaks off more bread, and another piece of fish, and hands it James, with the same instruction. Next comes John, and then Judas, and then Philip. You sit down, because at this point, the food is all gone. But it isn’t. Jesus gives some to Nathaniel and then Thomas. He motions to you, and hands you a surprisingly large chunk of fish, and some bread. “Don’t skimp now,” he says, grinning. “Give people as much as they want.” He’s crazy. You know you will run out before you have fed four people. You find a skinny old man who hasn’t yet been served by the others. He looks so hungry and thin, you don’t have the heart to deny him. You break off a big piece of fish, and tear your loaf of bread in half, and give it to him. Next is a young man, at the age where one is hungry all the time. You give him some, and he asks for more. You tear off some more, surprised there is any left. As you go through the crowd, it dawns on you. No matter how much you hand out, you still have plenty left to give the next person. It keeps going like that, and once you are done serving, you sit down and eat until you are full. Afterwards, each of you grabs a fish-sorting basket from Peter’s boat, and you go around collecting what the people couldn’t eat. All right, now, let’s make this practical in our own lives right now. First, of course, Jesus did this particular miracle in this way to show the people that he was the messiah. His actions are a very close parallel of how the Lord dealt with the people of Israel during the Exodus. They could hardly miss the significance of it all. He led them into the wilderness where they experienced their need, and then he satisfied that need. I’m sure the disciples first thought this was unfair. Jesus got them into this – why should they be the ones to figure a way out? But that wasn’t Jesus’ point, and it isn’t his point when he does this with us. His point is this: whatever resources you have – when you bring them to Him – are enough. 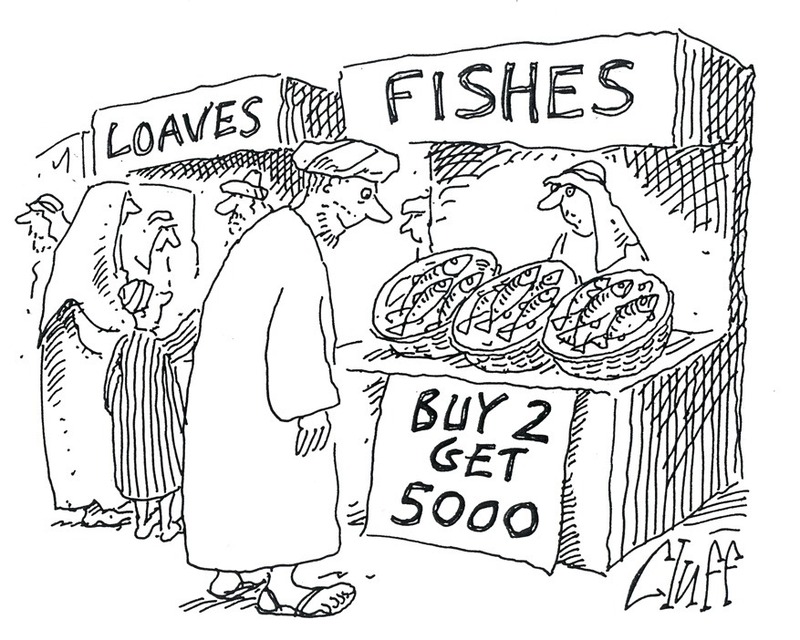 Five loaves of bread split between five thousand people is one one-thousandth of a loaf of bread for everyone. It is pathetic, even laughable. We are supposed to look at our resources and see how hopeless it is without Jesus. But when we bring what we have to Jesus – even when it is as pathetic as five loaves and two fish among five thousand – Jesus can turn it into enough. You probably aren’t reading this on a deserted hillside in Galilee with five-thousand hungry people. But you might be in the middle of another difficult situation, one that seems impossible. Perhaps you are in a very troubled place in one of your important relationships. Maybe you are in the midst of work or career difficulties. Maybe your struggle has to do with finances, or health. It might seem like you got into this mess in the first place by trying to follow Jesus. It might feel like he’s asking you to care of everything. You see, it isn’t what you bring that makes a difference. What makes the difference is that you bring it to Jesus. He can take the little you have, and make it enough – more than enough. Now, Jesus did ask the disciples to trust him. He provided the food. He supplied the miracle. But he asked his disciples to trust him, and to act on that trust. They took what he gave, and went out the crowd and gave it away. So also, he asks you to trust him. He will provide. He will take your pathetic resources and make them more than enough. But he wants you to trust that, and act on that trust. Listen as he tells you what to do right now, and then obey.